MSRP: 8.09 to 10.95 Euro + postage depending on where you shop at overseas. Whoever has done his National Service during these past twenty years has no doubt been the passenger, if not the driver, of a VAB (armoured amphibian vehicle). A real beast of burden of the land forces and operating since 1976. The VAB is used in all the theatres of operation where France is involved, notably for peace-keeping missions commisioned by the UN. Mainspring of the French troops in 1991 and used by the Daguet Division, the four-wheel drive VAB has demonstrated during military operations in Iraq, its transport capability and shown its main qualities which are freedom of movement on road and cross-country. More than 5,000 VAB's have been turned out in over 50 different versions which goes to show how polyvalent and simple its design is, thus enabiling very easy training, operating and maintenance. Heller is an older prolific model company based in France. The box art shows a VAB tooling down a dirt road and leaving a trail of dust. There is a burning tank in the background. The VAB is in a base of sand with wide bands of matt light-earth on it. It has a black inverted V on the sides of the hull and a white license number 0249 on a black plate on the left side of the nose. One crewman is manning the machine gun in the roof housing. A second cewman is looking out a rear roof hatch. One side panel says the box art subject is a VAB with 2e Compagnie, 2e REI, "Division Daquet", Yanbu, Arabie Saoudite, 26 March 1991. 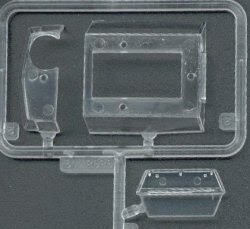 The model makes up to be 83 mm long, 29 mm high and 25 mm wide. There are 39 parts in the kit. Paint is required to complete the model and the kit is not suitable for children under 36 months due to small parts that may be swallowed. This is said in multiple languages including English. The kit is suitable for modelers over 8 years of age and was made in France. The other side panel repeats the box art smaller only. 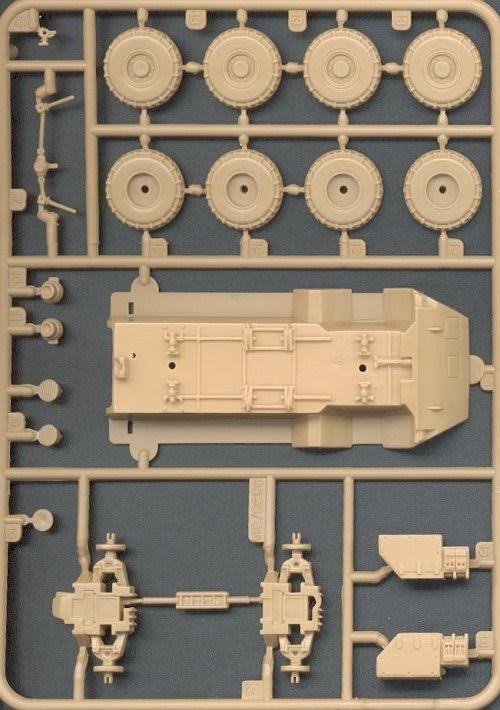 This kit contains 3 light tan parts trees, a clear tree, the decal sheet and the instructions. Parts are not cello bagged. 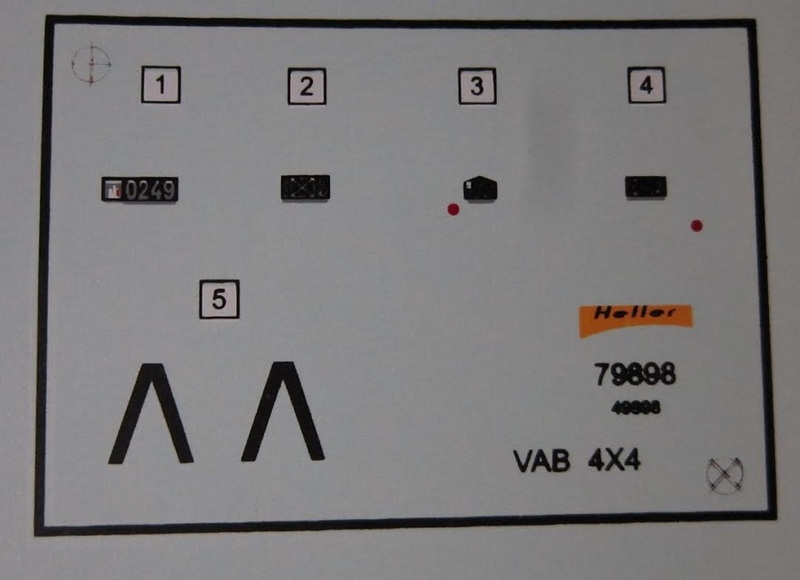 The instructions consist of a single sheet that is printed on both sides. It is 16 1/2" x 11 3/4" in size and folded several times to fit the small box. The face side of the sheet has photos of how to use hobby tools to build the model down each left and right edge of the sheet. In the center is the parts trees illustrations and the first 4 assembly step drawings. The bottom of the page has customer service coupons across the page in 6 languages including English. The other side of the sheet has the history of the VAB down the edges in multiple languages including English. Between these is 3 more assembly step drawings for a grand total of 6 and a 5 view of the lone painting and marking scheme provide (the box art subject). Again, spred across the bottom is 6 more customer coupons in more languages. The parts trees are not alphabetized, but they are numbered. ​The 3rd tan part is the upper body half. There are no crew figures included in this kit. This looks like it will be a simple kit to assemble in a short time. 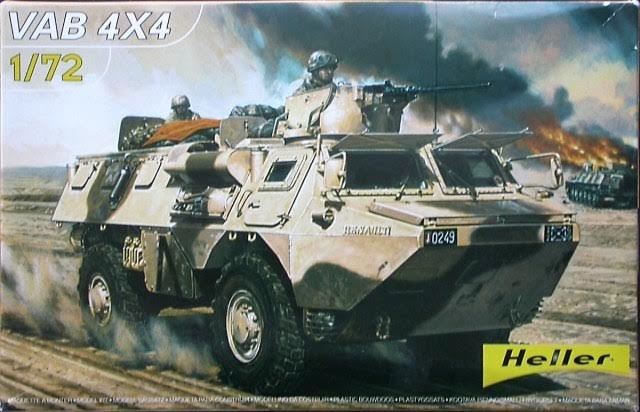 Recommended to all AFV modelers. I won my kit in a raffle at a recent IPMS contest I went to in a nearby town.